I've known about this one for a few months, but it's just recently been completed, uncovered, and turned on. 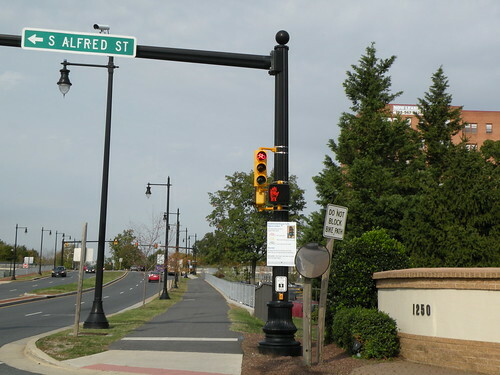 The city of Alexandria got rid of an annoying stop sign on the Mt. 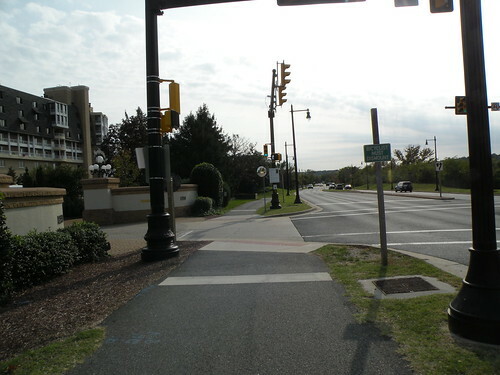 Vernon Trail at the entrance to the Porto Vecchio Condominiums...a stop sign routinely ignored by cyclists and at an intersection that already had a traffic signal. 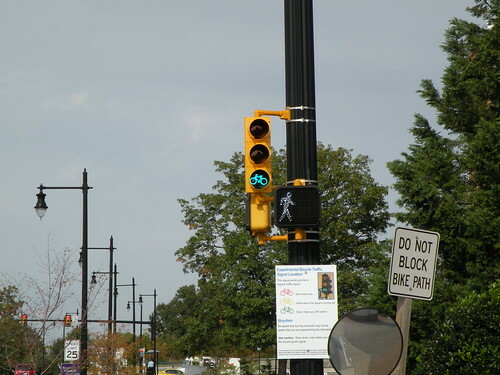 What they did was replaced it with an "experimental" (per FHWA) bicycle traffic signal, the second one in the D.C. area (DDOT had "first honors", at 16th/U/New Hampshire NW in DC). I noticed Monday that the Mt. Vernon Trail signal was finally uncovered and operating, so I went down and took a few photos. These and a few other photos are also in a Flickr set. A southbound view of the new signal. Note that the "Bicycles Must Dismount" sign is still posted. A closer view of the signal, looking northbound. Note the "Do Not Block Bike Path" sign for traffic coming out of the condos. 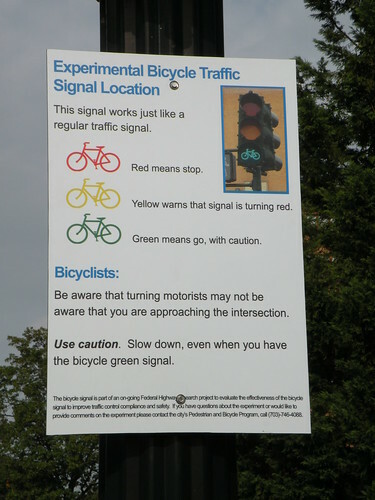 A close-up of the sign explaining how the signal works (in a nutshell, the same as a normal traffic signal). And yes, just like a normal traffic signal, it turns red. 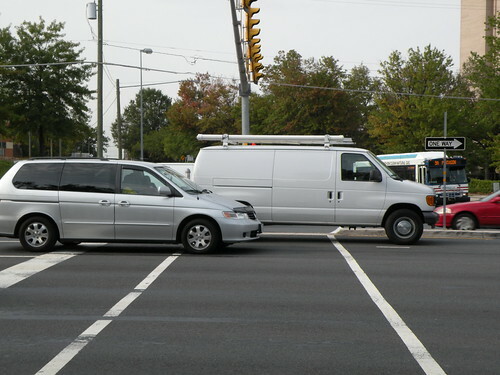 This was at Route 1 and Huntington Ave, where the vans were waiting in the left turn lane. The white work van in particular was pretty egregious. Been lax in posting lately (yeah, yeah)...so I'll try to make up for it here with some happenings from last night's Alexandria Transportation Commission meeting. A good chunk of the discussion centered on the Beauregard corridor plan. There's a general feeling from basically all parties involved (city staff, local residents, elected officials, etc etc) that transportation solutions for the corridor need to be found, funded, and built before the plan (and it's associated rezoning and redevelopment...up to 7.5 million square feet in some scenarios) can be implemented. The traffic issues with BRAC-133 at Mark Center are further complicating the matter. One commission member mentioned repeatedly that the upcoming traffic situation around Marc Center has reached "crisis level". Another commission member commented that the city can't ignore what's going on in adjacent jurisdictions, noting that development plans at Bailey's Crossroads, Skyline, and Shirlington, and specifically mentioning BRAC-related expansion at Ft. Belvoir, will all have an impact on traffic in the Beauregard corridor. City staff will respond in part by studying lower levels of density and modeling traffic at the lower densities. But the whole matter has reached a point where two City Councilmembers have written a letter to the city asking city officials to delay plans for higher density in the Beauregard corridor until a "workable and viable transportation plan" can be devised and implemented. What's interesting about this is that the previous topic at the meeting was focused on funding, and the generally dismal funding situation. Even if the city implements the Commercial Real Estate Tax to pay for transportation projects, the revenue from that wouldn't be enough to fully implement Beauregard area improvements, let alone needed improvements elsewhere in the city. Getting more money is not looking good. VDOT has effectively said to not count on them. Thanks in part to Congress' inaction, the Federal spigot is running dry. And thanks in part to how the state of Virginia works (and the General Assembly in particular), the only avenues the city has available are the Commercial Real Estate Tax and regular property taxes. The funding situation hasn't stopped the city from pressing on with planning, though. City staff have developed a preliminary list of "priority transportation projects" for discussion and input...projects that could be funded from the real-estate tax, and have separated them into two tiers. Tier One is all transit-related and focuses on the three proposed "high-capacity transit corridors" from the city's transportation master plan. It also includes the Landmark Transit Center and what has often been called the city's top transit priority: an extension of the Eisenhower Ave Metro platform and new station access on the north side of Eisenhower. Tier Two includes additional transit projects, namely trolley service to Del Ray and expansion of DASH (with the goal of providing 15-minute headways). Also included are some Complete Streets projects and three bike-related projects: improvements to Holmes Run between Beauregard and Ripley St, a trail extension along Backlick Run continuing to the Fairfax County line, and a new trail between Eisenhower Ave/Mill Rd and South Payne St running along the old Cameron Run channel. The city has also hired a consultant to study the three high-capacity transit corridors and and develop both more-refined corridors and recommend a specific mode (i.e. bus, BRT, streetcar, etc) for each corridor. The study has just kicked off, but some preliminary concepts are expected by the end of the year with the final report sometime next spring. Several commission members inquired about the public input process for the study. The response suggests that some workshops and public meetings at various points in the schedule were planned, but suggested to me that the public input part needs further thought. The meeting rounded out with Kevin Posey being elected the new chairman. After the meeting, I discovered just how small of a world it is: one of the commission members has been reading my road posts on a Usenet group for over 10 years. Small world, indeed.